It wasn't long after the U.S. got involved in WW2, that they struck a deal with the Jewish mob and the Italian crime families of New York to put pins in the longshoremen's union and keep supply ships on the north-eastern seaboard safe from the presumed threat of Nazi saboteurs. The results of this little test were questionable at best but they make for an interesting little piece of WW2 trivia and go to prove that even those who are bad have their better angels. The team of villains is formed by Amanda Waller, played by Viola Davis, who has turned the ancient witch, Enchantress, played by Cara Delevingne, into a teleporting super-spy and is now looking to expand her roster of entirely expendable undesirables. 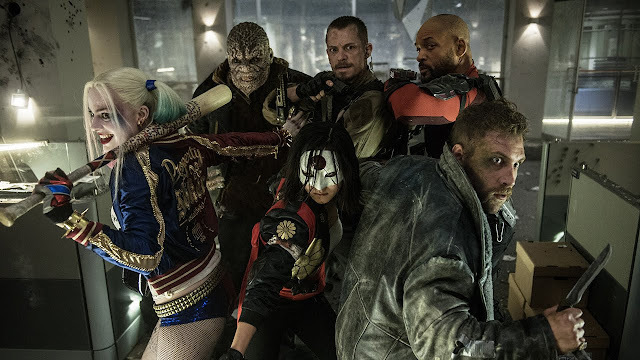 And to this extent, she makes a team out of the Joker's girlfriend, Harley Quinn (Margot Robbie), expert marksman Deadshot (Will Smith), reptilian Killer Croc (Adewale Akkinnuoye-Agbeje), El Diablo (Jay Hernandez) and Captain Boomerang (Jai Courtney). While they might all be bad guys, it doesn't mean that they can't be called on to do the right thing when it really matters and do the same thing that superheroes do in the movies: stop a skyward beam of energy from destroying the world. And lo and behold, in Midway City, the fictional home of Hawkman, something along those lines is happening and the group find themselves helicoptered right into the eye of the storm. Each one of them has been implanted with a micro-explosive which will explode if they get out of line and are put under the command of Rick Flag, played by Joel Kinnamon and his troupe of Navy SEALS who can number between two and twenty, depending on the scene. Unfortunately, like so many movies under the direction of Ayer, Suicide Squad feels like it went through a complete re-draft at the editing stage. It is clumsy, disrupted by several plodding flashbacks, filled with lines of dialogue which cut well into a trailer but not into a film and seemingly patched up with a mixture of embarrassing rock music cues. It is the only movie where you will find Fortunate Son, Bohemian Rhapsody, Sympathy for the Devil and Spirit in the Sky, all together. The movie is a real exercise in attitude if anything else. Even the idea of nihilist camaraderie falls flat, with the characters often stopping to pose rather than speaking to each other. But here, one does feel the need to jump to Suicide Squad's defence. Insofar as the current shared movie universe that DC is trying to put together, which began with Batman VS Superman, goes, it does have a house style which helps to differentiate it from the Marvel universe. Marvel movies feel like a well-plotted crossover event, while these DC ones, feel like a collection of art pieces and variant covers. When compared to the indistinguishable Hellicarrier stuff from Iron Man and Captain America, Suicide Squad feels rich with its grotesque touches and varieties of texture, ranging from the dank to the ostentatious. You only have to look at Ayers' last movie, Fury, to see a new visual style, which is kept up here. His camera certainly loves Jared Leto's, Joker, who spends the movie popping up intermediately, dressed up in gold lame and alligator embossed vinyl. His face chalk-white and his hair a really toxic green. Harley Quinn, who was his former psychiatrist, enters every single scene looking like some hypersexualised pin-up, except for one moment when she is apart from the rest of the squad, which suggests a flicker of an inner life. Both the Joker and Harley wiggle and paw like a homicidal but horny teen couple, who seem to have broken out of Arkum Asylum and straight into the movie - Spring Breakers, plunging into a chemical bath as if it is the ultimate gesture of goth-industrial romance.